Powers/Abilities: Geist was a scientific genius, and an expert in genetics and age retardation, as well as highly knowledgeable in various occult fields. He used various information, artifacts, and even tissue from/of various races of Earth's gods to create der Auferstehungs, a group of zombies, der Unsterblich, and ultimately the Great God Hydra. amongst the artifacts and materials used were bones from the sarcophagus of Gilgamesh, Spear of Achilles, a portion of the Elixir of Life obtained from Anqui Sheng, arrow of Hoder, blood from the Super-Soldier serum-enhanced Captain America (Steve Rogers), and blood from Thor Odinson. 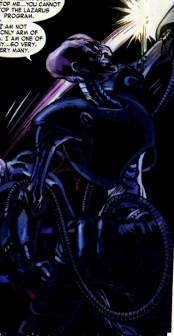 In the earliest days of the modern era (shortly after Captain America's revival by the Avengers), Geist wore an armored exoskeleton, which utilized four robotic tentacles (a la Dr. Octopus). The armor also apparently enabled him to generate a field able to entrap Captain America's shield (though that happened off panel and could have been another Hydra weapon), as well as to generate a cloudburst electromagnetic pulse (EMP) able to temporarily incapacitate Iron Man. 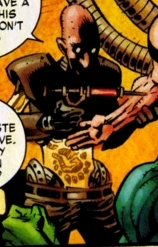 A few years later (circa Captain America I#170), Geist had replaced much of the muscle in neck and arm, at least, with cybernetically controlled robotic musculature. A few years later (circa Captain America I#335), Geist's cybernetic exoskeleton granted him various life support functions, as well as musculature, epidermis/skin, etc. over much of his body. He was physically strong enough to batter/stun the Captain (Steve Rogers, after he had had at least a few pints of blood drained and had already been punched through a tombstone by der Unsterblich); could fire energy blast able to stun/disperse armored SHIELD agents; could generate blinding light bursts; and had jet/rocket boots enabling him to escape capture from a whole Avengers team after stunning them with a dazzling light burst. In his final days, Geist was confined to a life support chair, his various systems failing altogether. The explosion that awakened the Great God Hydra left him amputated mid-right arm and mid-both legs, with death imminent. Being grafted to the Great God Hydra granted him a new vitality, and the strength to grapple with Commander Steve Rogers with his own full arm. (Captain America: Hail Hydra#5 (fb) - BTS) - Dr. Geist was the latest in a hundred generations of his family serving Hydra's Infinitas Agenda, gathering information, artifacts, and even tissue from/of various races of Earth's gods with the dual goals of achieving immortality and creating a race of gods to re-order Earth. (Captain America: Hail Hydra#1 (fb) - BTS) - Geist was significantly old (perhaps in his 50's or older, though he may have just been prematurely bald and wrinkled) in 1944. (Captain America: Hail Hydra#1 (fb) - BTS) - Geist and his brethren in the Thule Society saw the Allies' victory in World War II as inevitable before the first bombs dropped. (Captain America: Hail Hydra#1 (fb) - BTS) - Geist made alliances with the Nazi party to achieve some of their goals. (Captain America: Hail Hydra#1 (fb) - BTS) - Aided by Nazi resources and military muscle, the Thule Society plundered the vaults and libraries of every nation, including France, Italy, Russia, and Egypt. They collected the rarest and most obscure of forbidden knowledge, magic, alchemy, even physics. They tore the secrets from those who would protect it from the world. (Captain America: Hail Hydra#1 (fb) - BTS) - With the war going badly for the Nazis, Hitler demanded that the Thule Society rush Projekt Auferstehungs to its completion. (Captain America: Hail Hydra#1 (fb) - BTS) - Working out of Drache Castle, Geist's Projekt Auferstehungs filled the ranks of das Auferstehungs Corps via the Lazarus formula; once perfected, he intended to raise every German soldier from his grave. (Captain America: Hail Hydra#1) <July, 1944> - German Freedom League agent Trude Lohn led Captain America and Bucky to Drache Castle, Germany, in an effort to stop Projekt Auferstehungs. As Cap and Bucky broke in, Geist ordered the Nazi soldiers to fill them. The heroes made short work of them, but then Geist unleashed Erlking, followed by the rest of das Auferstehungs Corps ("the Resurrection Corps") on them, and Cap and Bucky fell before their relentless strength and numbers. Geist then had the Corps put the two heroes on the slabs and when Captain America awakened, Geist, noting that Cap must have had some sort of enhancements, expressed interest in dissecting him. Revealing some of the Thule Society's history and accomplishments, Geist then injected Captain America with the Lazarus formula. Frau Lohn then came to the rescue, shooting Geist in the right shoulder, freeing Cap and Bucky, and taking out some of the Corps with bullets through the brain. 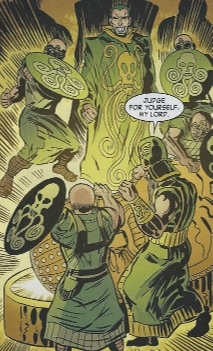 Geist fled, and Lohn caught up to him, threatening to have her people question him and striking him in his injured arm to illustrate how they might make him talk; but Baron Strucker came to Geist's rescue, stabbing Lohn through the chest from behind the tapestry upon which Geist leaned. As Strucker carried Geist to safety, he hurled a pair of grenades to keep Cap and Bucky from pursuing him. 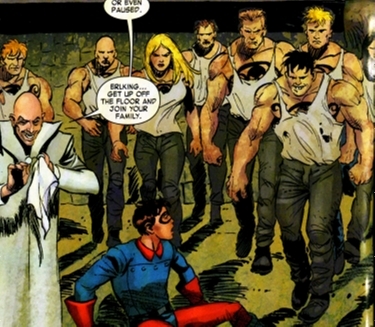 Cap and Bucky tended to Lohn while Strucker and Geist escaped. 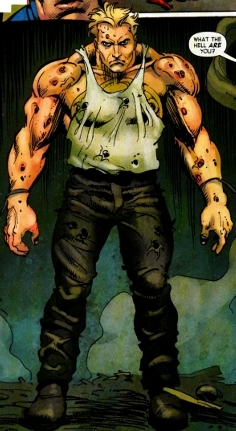 German Freedom League agents, including Krueger, took Lohn to safety and vowed to track down Geist and incinerate the Corps' bodies, but after Cap and Bucky's departure, they revealed themselves to be Hydra agents loyal to Geist. (Captain America: Hail Hydra#2 (fb) - BTS) - Trude Lohn (presumably as part of the German Freedom League) smuggled out Dr. Homler, a scientist working for an unspecified evil German group on a project with ties to Projekt Auferstehungs. (Captain America: Hail Hydra#2 (fb) - BTS) - Shortly after Captain America (who had fallen into suspended animation upon falling into freezing waters near the end of World War II) revived in the modern era (approximately 13 years ago, Marvel Time), Geist had Erlking of the Resurrection Corps dress up as Bucky and enter the grave placed in honor of Bucky (James Barnes, who had seemingly perished in an explosion at the same time Captain America had entered suspended animation; the grave was empty as Bucky's body had not been recovered). Other members of the Resurrection Corps hid underground in other graves. (Captain America: Hail Hydra#2 (fb) - BTS) - Geist's agents sent notes to Captain America and Trude Lohn, each seemingly from the other, inviting each one to meet the other at Bucky's memorial grave. Correctly suspecting a trap, Cap asked the Avengers to follow him there but to wait in hiding...just as Strucker suspected/anticipated. (Captain America: Hail Hydra#2) - When Captain America and Trude met at Bucky's memorial grave, Erlking (in a Bucky costume) burst out of the grave. Captain America dropped Erlking, but then the rest of the Resurrection Corps emerged to confront him. One of the Corps took Trude hostage, but then the Avengers (Giant-Man/Hank Pym, Iron Man/Tony Stark, Thor Odinson, Wasp/Janet Van Dyne) arrived and joined the fight. Watching in secret from a short distance away, Geist and Strucker commented on how things were going as planned, and Strucker gave Geist the honor of shooting Lohn with poison (and possibly the Lazarus formula). 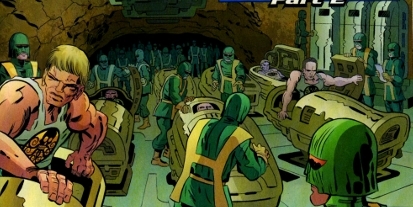 Afterwards, the Resurrection Corps escaped (as did Geist and Strucker; the Avengers never knew they were present), though the Avengers captured a fallen and decaying member (perhaps Strega?). Giant-Man studied the decayed corpse and was intrigued with Dr. Homler's notes, but as Cap visited the dying Lohn in the hospital, the corpse revived (reversing its decayed state), ambushed Giant-Man, and then led other Corps members to enter Avengers Mansion. 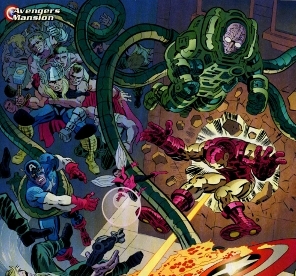 As Cap returned with Iron Man and Thor, the Corps members hurled Giant-Man though the mansion's doors at them, after which Geist and the rest of the Corps (along with several Hydra ships) confronted them. Geist caught Cap off guard by crediting the Lazarus formula with Cap's survival in the freezing waters for decades. Geist temporarily incapacitated Iron Man with a cloudburst EMP (electromagnetic pulse), then had one of the Corps fire an enchanted arrow (presumably the Arrow of Hoder) that passed through Captain America (apparently immaterial) and struck Thor in the back. As one of the Corps pummeled the weakened Thor, another member of the Corps (possibly the female that had been captured earlier) pulled the arrow out of Thor, after which Geist ordered the Corps back to the ships and they escaped. 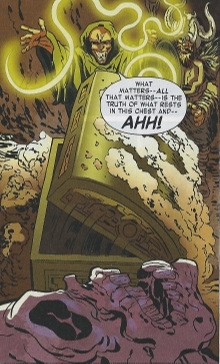 Back at the Hydra base, Strucker criticized Geist for revealing their existence to Hydra, but Geist felt there had been no risk; at worst, the Avengers might have destroyed the Corps. He further noted that the Corps were nothing compared to what was to come. He combined the blood of Captain America with that of Thor, noting that from the samples they would unlock the true secret of immortality as well as the lost Super-Soldier serum, with which they would finally and truly create das Herrenvolk (the master race - perfect soldiers...perfect beings...immortal and indestructible). Acknowledging that they lacked the technology to exploit their acquisitions, Geist was patient - Hydra had spent millennia on the project and they could wait a few decades for the science of genetics to grow out of its infancy. The Corps was returned to stasis chambers. (Captain America: Hail Hydra#3 - BTS) - From Homler's notes, Pym identified references to ancient people and places, including Gilgamesh, Alexander the Great, Achilles, Xu Fu...all tied to the quest for immortality. (Captain America: Hail Hydra#3 - BTS) <A few years ago, circa Captain America I#170> - Zombies serving under Geist attacked Solomon's Grotto, one of the most sacred places in Wakanda, and a repository of vast and ancient secrets, including ancient codices said to contain the alchemical formulae for the Elixir of Life (Solomon believed that no human should possess the secret, that immortality was a terrible curse rather than a gift. Solomon entrusted these secrets to one of the ancient Black Panthers, whom he believed could protect them; no one else was supposed to even know about the Grotto). (Captain America: Hail Hydra#3 - BTS) - Black Panther (T'Challa), Captain America, and the Falcon (Sam Wilson) destroyed the zombies at Solomon's Grotto. From the chest of one of the creatures, T'Challa found bag's filled with some exotic compounds (including the neurotoxin tetrodotoxin (found is certain species of blowfish), as well as toxins found in the bufo marinus cane toad and the osteopilus dominicensis treefrog...a mixture also known as a coup poudre, what Haitian bokors used to create zombies), as well as a disk containing a hydra. Captain America recognized the involvement of Hydra and Geist. (Captain America: Hail Hydra#3) - Dr. Geist discussed the hydra with other scientists of Hydra's Infinitas Agenda and reviewed their task to defeat death, purify the human species, and to thus become gods. Captain America traveled to Haiti to meet with Dr. Cyril Lewis, an ethnobotanist trained at the University of Pennsylvania, who was collating all information on coup poudre to create the perfect formula. They were attacked by a group of zombies as well as Erlking, who taunted Cap by accusations that his survival was related to the Lazarus formula, not the Super Soldier serum. Erlking snatched and nearly escaped with Dr. Lewis' notes, but the Falcon retrieved them. (Captain America: Hail Hydra#4 (fb) - BTS) - Dr. Geist was rebuilt with his cyborg systems functioning for life support, replacing most of his skin and muscle, at least some of his skeleton. (Captain America: Hail Hydra#4 (fb) - BTS) - Dr. Geist arranged a number of missions for Captain America to defeat agents of Hydra so he would see himself as invincible. Geist further arranged the leakage of information to keep Captain America on their trail and eventually lead to another confrontation where they might obtain more of his blood. (Captain America: Hail Hydra#4 (fb) - BTS) - Dr. Geist sent agents to the Crypt of the Red Immortals in Romania to capture a vampire and force her to reveal where they could find "his lair" (Dracula's?). Now using the alias "the Captain" due to conflicts with the US government, Rogers defeated the Hydra agents, released the vampiress they had captured, and pressured the Hydra agents for information. (Captain America: Hail Hydra#4 (fb) - BTS) - Strucker had Trude Lohn exhumed and partially resurrected, granting her decayed corpse her thoughts and memories, as well as the power of speech, but little else. Geist informed her of a plot to reanimate Arlington National Cemetery's so she would reveal this to Cap, telling him that Geist wanted 2 pints of Cap's blood in exchange for calling off the plot. (Captain America: Hail Hydra#4) - At an unspecified Hydra base, Dr. Geist noted with pride the history and accomplishments of Hydra's Infinitas Agenda and revealed the creation of "der Unsterblich" (the Immortal). 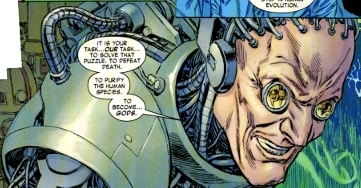 Strucker was pleased with der Unsterblich's readings, but Geist countered that they may have created a super-powerful man or monster; Geist further expressed frustration with the limits of scientific progress. 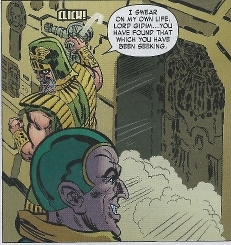 Strucker soothed Geist by revealing his plans to obtain more of Cap's blood. Strucker and Geist subsequently watched der Unsterblich easily overcome a group of Hydra's zombies. Meanwhile, Nick Fury gave the Captain information on newly discovered Hydra bases, and Cap took out the Hydra agents at the Yummy Yum-Yum Cookie Company, where he encountered the partially resurrected Trude Lohn, who delivered her message. She then begged Cap to put her out of her misery, and he complied, then left a message instructing Geist and his allies to meet him at Arlington at Sunset. Geist discussed with Hydra how they would force the Captain and America to realize how truly vulnerable they were and how easily their peace of mind could be torn away. The resulting feeling of inferiority would be a fertile breeding ground for a new race of gods. (Captain America: Hail Hydra#4 (fb) - BTS) - Geist's agents made calls and sent out telegrams to every newspaper and wire service, arranging for them to be present at Arlington to witness the spectacle. (Captain America: Hail Hydra#4) - Geist's agents confronted Cap, Fury, and the Falcon en masse, and der Unsterblich ambushed and overpowered Cap, allowing Geist to draw blood from him and brag about having called the press; but then, as planned, Dr. Stephen Strange cast a spell of darkness preventing anyone outside from viewing the events, and then a group of Avengers then joined the fight. 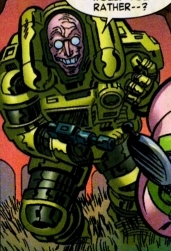 Geist mocked them that even if the heroes killed him and all of his present allies, the Lazarus Project would continue. Unsurprised when Thor swiftly incapacitated der Unsterblich and then Cap tried to arrest him, Geist taunted Cap that the whole purpose of the mission was to obtain the blood sample he had already gotten. He then used his powerful exoskeleton to strike down Cap (weakened from the blood draining), blasted Fury and the SHIELD agents, and then released a blinding burst of light as he escaped via rockets in his boots. (Captain America: Hail Hydra#5 (fb) - BTS) - Seeing his own death as imminent, Geist, now "a lump of flesh kept alive completely by machines," began to accelerate the Infinitas Agenda. (Captain America: Hail Hydra#5 - BTS) - Steve Rogers (who had yielded the Captain America identity to the recovered James "Bucky" Barnes and had adopted the alias of "Commander Rogers") sent Captain America (Barnes) to the Metropolitan Museum of Art, where he stopped a group of Hydra agents from obtaining the Puzzle Box of Ko Hung, which allegedly contained the formula for the Elixir Vitae inscribed on inside it but had thus far proven a puzzle no one could solve; the Black Widow (Natasha Romanoff) to the pyramid of Giza's lost chamber of Horus, where she stopped a group of Hydra agents from obtaining the canopic jars containing the actual blood and organs of Horus; Luke Cage to the Hydra Genetics Lab in Newark, New Jersey, where he overpowered a group of Hydra scientists; and Cap (Barnes) and War Machine (Jim Rhodes) to Turkey and Chile. The Avengers thus obtained four items Geist was seeking to complete his Lazarus formula. (Captain America: Hail Hydra#5) - At Hydra Lab#119 (aka "The Cauldron"), Commander Dieter Montag, Chief of Special Operations for Hydra, chastised Geist, noting how the Avengers had targeted his project, were hitting them at every turn, and might discover "The Cauldron" before long; based on Strucker's orders of secrecy over haste, Montag decided they must move that laboratory at once. Dr. Geist countered that they were at a critical junction and movement would risk a biomedical emergency that would set them back 20 years. His own body failing, Geist noted that he did not have 20 years, and Montag reminded Geist that the project was meant to be for the betterment of Hydra, rather than just the last hope of an old man; Geist quickly agreed that it has always been about their goals, and reminded that he was the latest in the hundred generations of his family before him serving Hydra. Soon after, Geist had a number of Hydra agents sacrificed to produce living blood, the final ingredient needed to awake the "gods" he was creating. Geist then had Montag called away to an emergency at another base while he prepared to start the process. When another agent noted the final elements they did not have, the desperate Geist conceded that those items were lost to them and now in Rogers' hands; Geist nonetheless initiated the process, unleashing explosive force that nearly ended his feeble form (and left him missing part of both legs and half of his right arm)..
(Captain America: Hail Hydra#5 - BTS) -Meanwhile, Rogers identified three Hydra bases that most likely served as Geist's lab and sent three Avengers teams to assault each base simultaneously in cloaked Quinjets. (Captain America: Hail Hydra#5 - BTS) - Geist ordered his loyal Hydra agents to connect him to one of the gods to maintain his life. (Captain America: Hail Hydra#5) - Two groups of Avengers assaulted Hydra based in Chicago and Yosemite National Park (the latter of which Montag had been sent), while Rogers led Black Widow (Natasha Romanoff), Cage, Captain America (Barnes), Hawkeye (Clint Barton), Thor, and War Machine assaulted the base beneath the Statue of Liberty, which proved to be Geist's base, "The Cauldron." Erlking sent a group of zombies to battle the heroes and tried to convince Cap to join them, not realizing this Cap wasn't Rogers, and Barnes punched him out, while the other Avengers routed their other attackers. Nonetheless, the delay enabled the "Great God Hydra" to revive, which Geist spliced to its chest. The Avengers attacked, but the revitalized Geist fought back against Rogers until the Great God Hydra (GGH) grabbed Rogers. 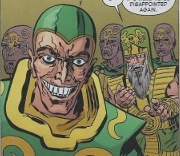 As the GGH struggled with speech and awareness, Geist ranted about humanity being a failed experiment that the Hydra's new race of gods would erase, and the stories of the future would be about racial purity, ideological harmony, sophistication, and cosmic consciousness. 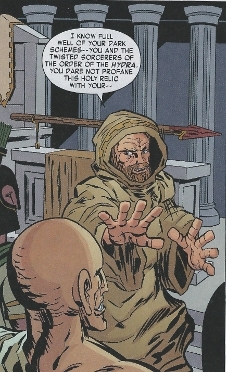 Geist admitted that this first god was not perfect, as Rogers had forced his hand, but that the gods were designed to be vital beings, who would learn, grow, and adapt, as he guided and taught them while they evolved into true omnipotence..."and ever will the masters of Hydra be the high priests of the new celestial church of the one, truth faith." Geist urged the GGH to crush Rogers, but the GGH refused, noting "I am god...I am...I...not we" as he tore Geist from his chest. Claiming to see backward and forward into eternity, the GGH noted that only gods lived forever, not mortals. Dying, Geist told the GGH he had made him and could no longer live apart from him as he begged for mercy. The GGH granted him mercy and oneness with the universe, instantly crushing him to death in his hand. The GGH noted that Rogers was the champion of not just his country, but his species, his world, and ultimately many worlds. Refusing to spend the first hour of life his eternal wandering by attempting to destroy that which fate itself had fashioned, the GGH blessed Rogers and bade him farewell. Comments: Created by Jonathan Maberry and Sergio Cariello. Geist is German for spirit. I'd considered a profile for Ponce de Leon, too, but I think he has a lot more other appearances, so I'll leave that for someone who has more knowledge of the historical character and who wants to fully cover him. GEIST (Nikolaus Geist) - German cyborg, former Nazi + advisor to Hitler, post World War II bartered German rocket scientists to O.S.S. to escape war crime prosecution, aided covert CIA activities, including employment under Felix Guillermo Caridad, purchased Roughouse from Gen. Coy, manipulated Coy + prince Baran to obtain cocaine grown over remains of Spore, following death of Caridad + revolution, extradition to USA was assisted by CA, but was tracked down by Magneto who sought vengeance for his Nazi activities. ZEITGEIST (Larry Ekler) - Schutz Heiliggruppe, funded and trained by Dr. Faustus, obtained weaponry from Secret Empire, used time camera and camoflauge gadgetry, duplicate form of others, embarked on mission to slay superhumans, beginning in South America, Faustus arranged admission into Schultze Heiligruppe to capture and slay Red Skull, attempted to slay those present at Angel (Halloway)'s party for golden age heroes, killed when attempted to stab Vormund and had blade reflected back on him. Lord Gidim was a member of Hydra, or whatever it was called at that time. He was apparently Geist's ancestor. (Captain America: Hail Hydra#2 (fb) - BTS) - King Gilgamesh ordered that his body be hidden from men after his death to prevent those such as the order of "Hydra" from using his bones to their ends. Upon his death, his body was placed in a sarcophagus and sealed within a hidden chamber in the House of Dust. 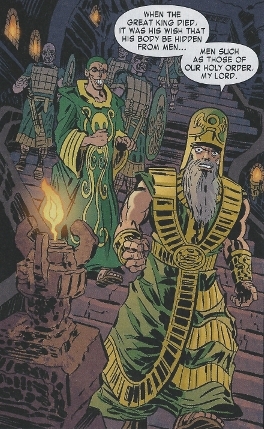 (Captain America: Hail Hydra#2 (fb) - BTS) - Circa 2672-2671 BC, Lord Gidim visited 17 ancient tombs in 14 months in search of the bones of Gilgamesh, but each tomb proved to be a sham. (Captain America: Hail Hydra#2 (fb)) - Circa 2671 BC in Mesopotamia, accompanied by four agents, Lord Gidim was welcomed to the House of Dust by Nashtoth, and he warned Nashtoth it would be unfortunate if he was disappointed again. Swearing on his own life that he had found that which Gidim had been seeking, Nashtoth led Gidim through a secret passageway to a sarcophagus containing the bones of Gilgamesh. As Nashtoth and one of the other agents/warriors opened the container and revealed its glowing contents, Gidim was pleased. He told Nashtoth that he had done well and that their work may now begin. He presumably referred to the process of trying to attain immortality and/or to create a new race of gods. Note: Gidim are apparently the Sumerian equivalents of ghosts. (Captain America: Hail Hydra#2 (fb) - BTS) - Circa 2671 BC in Mesopotamia, Nashtoth of the Order of "Hydra," located the bones of Gilgamesh within the House of Dust, and he summoned Lord Gidim to show them to him. (Captain America: Hail Hydra#2 (fb)) - Brother Nashtoth welcomed Lord Gidim to the House of Dust and then led Gidim through a secret passageway to a sarcophagus containing the bones of Gilgamesh. This would allow them to begin the process of trying to attain immortality and/or to create a new race of gods. Note: In the Marvel Universe, Gilgamesh is one of the aliases of the Forgotten One. It is unclear whether the mythological Gilgamesh was a separate person or not. Brother Nashtoth was a member of Hydra, or whatever it was called at that time. (Captain America: Hail Hydra#2 (fb) - BTS) - Circa 2671 BC in Mesopotamia, he located the bones of Gilgamesh within the House of Dust, and he summoned Lord Gidim to show them to him. (Captain America: Hail Hydra#2 (fb)) - Brother Nashtoth welcomed Lord Gidim to the House of Dust. Swearing on his own life that he had found that which Gidim had been seeking, Nashtoth led Gidim through a secret passageway to a sarcophagus containing the bones of Gilgamesh. As Nashtoth and one of the other agents/warriors opened the container and revealed its glowing contents, Gidim was pleased. He told Nashtoth that he had done well and that their work may now begin. He presumably referred to the process of trying to attain immortality and/or to create a new race of gods. Lord Mormo was a member of the Order of the Hydra. 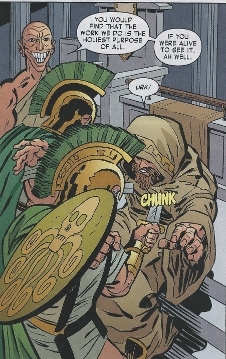 (Captain America: Hail Hydra#2 (fb) - BTS) - Lord Mormo was with Alexander the Great when he paid half of his treasury to purchase the Spear of Achilles. (Captain America: Hail Hydra#2 (fb)) - Circa 323 BC, at the Temple of Athena on the Acropolis of Phaselis, Lycia, shortly after the death of Alexander the Great, Lord Mormo, accompanied by at least three soldiers of the Order of Hydra, claimed the Spear of Achilles. 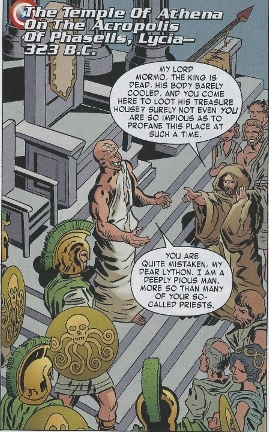 Lython opposed Mormo's actions, cursing his impious actions and dark schemes, but Mormo assured Lython he was a deeply pious man and that his order did the holiest work of all (He presumably referred to the process of trying to attain immortality and/or to create a new race of gods.). Mormo's warriors rushed forward and stabbed Lython, presumably to death. Note: Mormo is also the name for a female specter used to frighten children in ancient Greece. 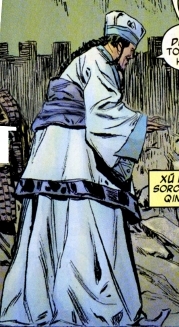 (Captain America: Hail Hydra#3 (fb)) - Xu Fu, court sorcerer of the Qin dynasty (under Emperor Qin Shi Huang) asked Anqi Sheng for the Elixir of Life. Sheng sent him away, noting the price would be the lives of 3000 children, pure and from the very best families. (Captain America: Hail Hydra#3 (fb)) - Circa 209 BC, Xu Fu and his agents in that time/place's incarnation of the Order of Hydra met with the "great and glorious immortal" Anqi Sheng, presumably on Mt. Penglai. Xu noted his honor to again stand before Sheng's holy presence and agreed to pay the price, having brought the 3000 children as requested. Finding the offer quite acceptable, Sheng noted that he, like Xu, served a greater master; Sheng had no doubt his own master would appreciate the purity and generosity of Xu's gift. In exchange, Sheng supplied a single component of the Elixir of Life, one which was found nowhere else on Earth and without which one could not create the elixir. Having expected the complete Elixir, Xu was enraged, questing whether they could even trust the gods and whether the universe was so corrupt and unjust. Sheng replied that the universe was not corrupt, but rather complex...and that complexity existed as a pathway, however crooked, from ignorance to complete understanding; the gods want man to learn, to aspire, to strive...this was the pathway to enlightenment, to eternal life. Note: Anqi Sheng, Xu Fu, and Qin Shi Huang have some historical/mythological significance. You can Google them for more information. Anqui Sheng was apparently a god-like immortal who dwelled on Mt. Penglai. (Captain America: Hail Hydra#3 (fb)) - Circa 209 BC, Xu Fu and his agents in that time/place's incarnation of the Order of Hydra met with Anqi Sheng, presumably on Mt. Penglai. Xu agreed to pay the price, having brought the 3000 children as requested. Finding the offer quite acceptable, Sheng noted that he, like Xu, served a greater master; Sheng had no doubt his own master would appreciate the purity and generosity of Xu's gift. In exchange, Sheng supplied a single component of the Elixir of Life, one which was found nowhere else on Earth and without which one could not create the elixir. Having expected the complete Elixir, Xu was enraged, questioning whether they could even trust the gods and whether the universe was so corrupt and unjust. Sheng replied that the universe was not corrupt, but rather complex...and that complexity existed as a pathway, however crooked, from ignorance to complete understanding; the gods want man to learn, to aspire, to strive...this was the pathway to enlightenment, to eternal life. (Captain America: Hail Hydra#2 (fb)) - Circa 710 AD, in the town of Ribe, Jutland, Draugr's men unearthed the bones of Eggther, one of the giants foretold in the stories of Ragnarok. His associate, Strybiorn, cursed their actions as the Devil's work and the bones as unnatural, and questioned how and why Eggther would be dead if the prophesized events of Ragnarok had not yet occurred. 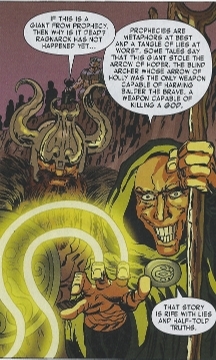 Noting how prophecies were "metaphors at best and a tangle of lies at worst, Draugr further commented on some tales crediting Eggther with stealing the Arrow of Hoder, the blind archer whose arrow of holly was the only weapon capable of harming Balder. A weapon capable of killing a god. Draugr noted that that story was rife with lies and half-told truths, but that all that mattered was what rested within the chest clutched within Eggther's hands. With a mystic gesture, Draugr opened the chest and claimed the Arrow of Hoder. Comments: Presumably Eggther came from a previous age of Asgard and a previous Ragnarok. Note: Draugr is apparently a word associated with ancient Norse mythology referring to ghosts. (Captain America: Hail Hydra#2 (fb) - BTS) - According to Draugr, the Arrow of Hoder was made of holly and was the only weapon capable of harming Balder. "A weapon capable of killing a god." The giant Eggther apparently stole the arrow of Hoder, the blind archer, during Ragnarok (see comments). It was contained within a chest that Eggther clutched within his hands even after his death. (Captain America: Hail Hydra#2 (fb)) - Circa 710 AD, in the town of Ribe, Jutland, Strybiorn was present with Draugr and his men before the unearthed the bones of Eggther. Draugr noted that this story was rife with lies and half-told truths, but that all that mattered was what rested within the chest clutched within Eggther's hands. With a mystic gesture, Draugr opened the chest and claimed the Arrow of Hoder. (Captain America: Hail Hydra#2) - (Captain America: Hail Hydra#2 (fb) - BTS) - Shortly after Captain America (who had fallen into suspended animation upon falling into freezing waters near the end of World War II) revived in the modern era (approximately 13 years ago, Marvel Time), Geist had one Corps fire an enchanted arrow (presumably the Arrow of Hoder) that passed through Captain America (apparently immaterial) and struck Thor in the back. As one of the Corps pummeled the weakened Thor, another member of the Corps (possibly the female that had been captured earlier) pulled the arrow out of Thor, after which Geist ordered the Corps back to the ships and they escaped. 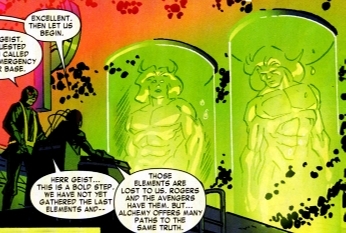 Back at the Hydra base, Geist combined the blood of Captain America with that of Thor, noting that from the samples they would unlock the true secret of immortality as well as the lost Super-Soldier serum, with which they would finally and truly create das Herrenvolk (the master race - perfect soldiers...perfect beings...immortal and indestructible). Comments: Presumably this Arrow of Hoder came from a previous age of Asgard and a previous Ragnarok. Most sources I've read, including the Marvel Universe versions, have Balder's weakness being mistletoe, and that was what Hoder's arrow was made of. Further, the arrow would only be dangerous to Balder, though presumably any mystic arrow from Asgard could harm another Asgardian god as well. (Captain America: Hail Hydra#2 (fb) - BTS) - The giant Eggther apparently stole the Arrow of Hoder, the blind archer, during Ragnarok (see comments). It was contained within a chest that Eggther clutched within his hands even after his death. (Captain America: Hail Hydra#2 (fb)) - Circa 710 AD, in the town of Ribe, Jutland, Strybiorn was present with Draugr and his men before the unearthed the bones of Eggther, one of the giants foretold in the stories of Ragnarok. 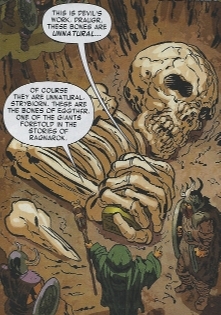 Strybiorn (apparently not affiliated with Draugr's Order of the Hydra, or whatever it was called at the time) cursed their actions as the Devil's work and the bones as unnatural, and questioned how and why Eggther would be dead if the prophesized events of Ragnarok had not yet occurred. With a mystic gesture, Draugr opened the chest and claimed the Arrow of Hoder. Strybiorn was unimpressed, noting he could give Draugr a thousand arrows, and stouter ones; he wondered what Draugr would hunt with such a puny dart, and Draugr answered, "immortality." (Captain America: Hail Hydra#3 (fb)) - Circa 1522 AD, on the banks of the Caloosahatchee river in what would become Florida, Count Duende and his incarnation of the Order of the Hydra slaughtered numerous other Spaniards before threatening his cousin, Juan Ponce de Leon y Figueroa to obtain the location of the Fountain of Youth. When Ponce de Leon told him there was "nothing in this godforsaken place except mosquitoes, alligators, and bloodthirsty savages, Duende stabbed Ponce de Leo in the chest, killing him. Duende noted this to be a pity, as he used to have such faith in his cousin; Duende declared the whole matter a waste of time and money. He then instructed his men to tear the place apart with hatchets and arrows so others would think the slaughter had been done by savages. (Captain America: Hail Hydra#3 (fb)) - Circa 1537 AD, in Spain, Dr. Garibaldi was brought before the Tribunal of the Holy Office of the Inquisition, actually composed of a trio representing an incarnation of the Order of Hydra. When Garibaldi refused to confess his guilt despite the Tribunal having all of his research into alchemy and the mysteries of eternal life, the Tribunal elected to offer him a job. (Captain America: Hail Hydra#3 (fb)) - Circa 1537 AD, in Spain, Dr. Garibaldi was brought before the Tribunal of the Holy Office of the Inquisition, actually composed of a trio representing an incarnation of the Order of Hydra. Garibaldi refused to confess his guilt despite the Tribunal having all of his research into alchemy and the mysteries of eternal life. He claimed alchemy not to be a sin against Heaven; "If God's gifts include our intellect and free will, then how is it heresy to use those to try to understand God's universe? Quote me the scripture forbidding me from using what God himself has bestowed!" Accused of seeking to unlock the mystery of eternal life, he admitted that he did so for the betterment of mankind. "To defeat sickness, to preserve life! That work is holy. It is a work that serves God. Condemn me if you want, and be damned to you!" The Tribunal leader responded, "You have shown your true nature. I will not condemn you. Rather the reverse. I would like to offer you a job." Erlking is clearly identified...Stega not so much (that I saw); my guess is that Strega is the blonde female agent (central in the main image; the one without the laceration on her right cheek), as she was by Geist's side when Cap and Bucky awakened, and she was one of the only ones shown to be doing anything specific, such as examining the bound Cap, checking on Geist after he had been shot, and receiving orders to take out Trude Lohn. (Captain America: Hail Hydra#1 (fb)) - Dr. Geist led Projekt Auferstehungs, which resurrected a number of "brilliant and decorated, ruthless and dedicated" soldiers who had died in the service of the Third Reich. Geist oversaw the unearthing of these soldiers' corpses. (Captain America: Hail Hydra#1 (fb) - BTS) - With the war going badly for the Nazis, Adolf Hitler demanded the Thule Society rush Projekt Auferstehungs to its completion. (Captain America: Hail Hydra#1 (fb) - BTS) - Working out of Drache Castle, Geist's Projekt Auferstehungs filled the ranks of das Auferstehungs Corps ("the Resurrection Corps") via the Lazarus formula; once perfected, he intended to raise every German soldier from his grave. (Captain America: Hail Hydra#1) <July, 1944> - German Freedom League agent Trude Lohn led Captain America and Bucky to Drache Castle, Germany, in an effort to stop Projekt Auferstehungs. After Cap and Bucky broke in, Geist unleashed Erlking, who arose despite having taken dozens of bullets, knocked down Bucky, and then surprised Cap by catching his hurled shield and throwing it back with sufficient force to lodge it deeply into a stone wall. Cap regained his composure and attacked anew, but Erlking further surprised him with his strength via a gut-punch as Cap leapt it him, knocking Cap to the ground. Recovering, Cap delivered a series of blows to Erlking, finally dropping him with a punch that broke his jaw. Geist then revealed at least 13 more of the Corps, and then Erlking arose once again. Geist initially ordered the Corps to kill the heroes, then thought better of it and ordered them captured so he could enjoy them further; Cap and Bucky fell before their relentless strength and numbers. (Captain America: Hail Hydra#1 - BTS) - Geist had the Corps put the two heroes on the slabs. (Captain America: Hail Hydra#1) - When Captain America awakened, Geist injected Cap with the Lazarus formula. Trude Lohn then came to the rescue, shooting Geist in the right shoulder, freeing Cap and Bucky, and taking out some of the Corps with bullets through the brain, including the prominent blonde female (Strega?). 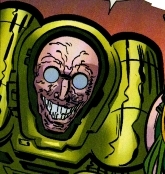 Geist fled, and Strucker stabbed the pursuing Lohn, then Strucker and Geist escaped. German Freedom League agents, including Krueger, took Lohn to safety and vowed to track down Geist and incinerate the Corps' bodies, but after Cap and Bucky's departure, the alleged GFL revealed themselves to be Hydra agents loyal to Geist. Krueger ordered one of the blonde female Corpsmen (Strega?) to get up, and she revived, despite a bullet through her forehead. (Captain America: Hail Hydra#2 (fb) - BTS) - Shortly after Captain America revived in the modern era (approximately 13 years ago, Marvel Time), Geist had Erlking of the Resurrection Corps dress up as Bucky and enter the grave placed in honor of Bucky (James Barnes, who had seemingly perished in an explosion at the same time Captain America had entered suspended animation; the grave was empty as Bucky's body had not been recovered). Other members of the Resurrection Corps hid underground in other graves. (Captain America: Hail Hydra#2 (fb) - BTS) - Geist duped Captain America and Trude Lohn with faked invitations to Bucky's memorial grave, each seemingly from the other. Correctly suspecting a trap, Cap had the Avengers follow him there but to wait in hiding...just as Strucker suspected/anticipated. (Captain America: Hail Hydra#2) - When Captain America and Trude met at Bucky's memorial grave, Erlking (in a Bucky costume) burst out of the grave. Captain America dropped Erlking, but then the rest of the Resurrection Corps emerged to confront him. One of the Corps took Trude hostage, but then the Avengers (Giant-Man/Hank Pym, Iron Man/Tony Stark, Thor Odinson, Wasp/Janet Van Dyne) joined the fight, and Thor dropped the Corps member holding Trude. Watching in secret from a short distance away, Geist shot Lohn with poison (and possibly the Lazarus formula). Afterwards, the Resurrection Corps escaped, though the Avengers captured a fallen and decaying member (perhaps Strega?). 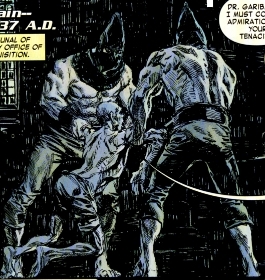 Giant-Man studied the decayed corpse (her tissues showing advanced necrosis despite having appeared vital less than 6 hours before, and subsequently returning to that vital form when needed) and was intrigued with Dr. Homler's notes, but as Cap visited the dying Lohn in the hospital, the corpse revived (reversing its decayed state), ambushed Giant-Man, and then led other Corps members to enter Avengers Mansion. As Cap returned with Iron Man and Thor, the Corps members hurled Giant-Man though the mansion's doors at them, after which Geist and the rest of the Corps (along with several Hydra ships) confronted them. Geist caught Cap off guard by crediting the Lazarus formula with Cap's survival in the freezing waters for decades. Geist subsequently had one of the Corps fire an enchanted arrow (presumably the Arrow of Hoder) that passed through Captain America (apparently immaterial) and struck Thor in the back. As one of the Corps pummeled the weakened Thor, another member of the Corps (possibly the female that had been captured earlier) pulled the arrow out of Thor, after which Geist ordered the Corps back to the ships and they escaped. Back at the Hydra base, as Geist and Strucker debated Geist's actions, the Corps was returned to stasis chambers. (Captain America: Hail Hydra#3) - Captain America traveled to Haiti to meet with Dr. Cyril Lewis, who was collating all information on coup poudre to create the perfect formula for zombies. They were attacked by a group of zombies as well as Erlking, who taunted Cap by accusations that his survival and the very Super-Soldier formula were related to the Lazarus formula. Erlking snatched Dr. Lewis and nearly escaped with Dr. Lewis' notes, but the Falcon retrieved them from Erlking's grasp as Erlking fell down a waterfall; Erlking escaped. (Captain America: Hail Hydra#4) - Das Auferstehungs Corps MAY have been among Geist's agents that confronted the Captain (Steve Rogers), Nick Fury, and the Falcon (Sam Wilson), though a large group of Avengers joined the fight as well; ultimately, Geist obtained a fresh supply of Cap's blood before escaping. The fate of the remaining combatants is not, but they were likely captured or destroyed in battle with the Avengers. (Captain America: Hail Hydra#5) - Rogers led Black Widow (Natasha Romanoff), Luke Cage, Captain America (Barnes), Hawkeye (Clint Barton), Thor, and War Machine (James Rhodes) assaulted the base beneath the Statue of Liberty, which proved to be Geist's base, "The Cauldron." Erlking sent a group of zombies to battle the heroes and tried to convince Cap to join them, not realizing this Cap wasn't Rogers, and Barnes punched him out, while Cage and the other Avengers routed Auferstehungs Corps and their other attackers. Ultimately, Geist's creation, the "Great God Hydra," rejected and apparently slew Geist before departing to seek its destiny. Erlking and any other Auferstehungs Corps' fates are unrevealed. Der Unsterblich (or, the Immortal, in English), was the culmination of over 6000 years worth of the Infinitas Agenda/Lazarus Project up to the time of Captain America#335 or so. "6000 years of exploration and experimentation, delving into the darkest regions of magic and creating new fields of science (he claimed alchemy to have been largely a byproduct of the Infinitas Agenda)...the blood of Achilles, Hector, Thor (Odinson) and Captain America (Steve Rogers)...DNA from gods to make giants. Drops of the Elixir Vitae, the rarest elements brought together in the most complex potion ever attempted." He was made as physically perfect as possible, and his intelligence was elevated with subliminal education on everything from physics to karate. 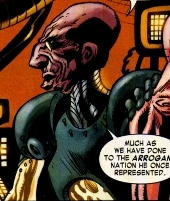 Strucker was pleased with der Unsterblich's readings, but Geist countered that they may have created a super-powerful man or monster; Geist further expressed frustration with the limits of scientific progress. Strucker soothed Geist by revealing his plans to obtain more of Cap's blood. 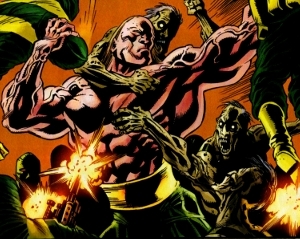 Strucker and Geist subsequently watched der Unsterblich easily overcome a group of Hydra's zombies. 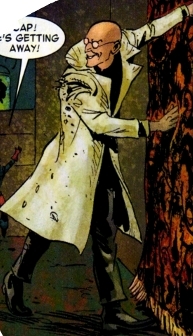 In Arlington National Cemetery, Geist's agents confronted Cap, Fury, and the Falcon en masse, and der Unsterblich ambushed and overpowered Cap, allowing Geist to draw blood from Cap and brag about having called the press; but then, as planned, Dr. Stephen Strange cast a spell of darkness preventing anyone outside from viewing the events, after which a group of Avengers then joined the fight. Thor swiftly incapacitated der Unsterblich with a single throw of his hammer. Der Unsterblich was apparently over 7' tall. He was superhumanly strong (he threw the Captain/Steve Rogers through two tombstones) and durable (taking a kick to the face from Cap without even blinking), and likely had an enhanced lifespan. However, he was not particularly bright...Geist was not surprised to see him defeated, noting him to be part of a work in progress. 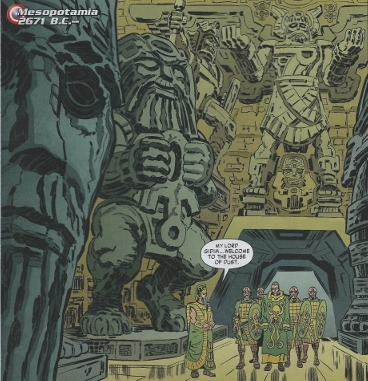 Brought to life in "The Cauldron," (aka Hydra Base#119), hidden beneath the Statue of Liberty, the "Great God Hydra" was the culmination of 6000-7000 years of research in the fields of immortality and developing a race of gods (see Geist's main entry and the other sub-profiles). As Geist's body began to fail in recent years, he became desperate. 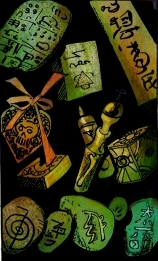 Steve Rogers and the Avengers obtained these sought items first: The Puzzle Box of Ko Hung, which allegedly contained the formula for the Elixir Vitae inscribed on inside it but had thus far proven a puzzle no one could solve; canopic jars from the pyramid of Giza's lost chamber of Horus, containing the actual blood and organs of the Heliopolitan god Horus; and unspecified artifacts and/or information from Turkey and Chile. 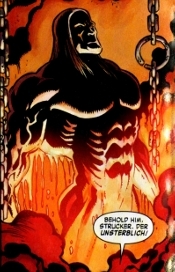 No longer having any time to spare/waste, Geist proceeded with the process anyway, sacrificing other Hydra agents to provide "living blood" to the would-be gods, and then activating some energy source via a button that unleashed energy that shredded Geist's frail form; one of at least four giant, god-like beings was awakened. 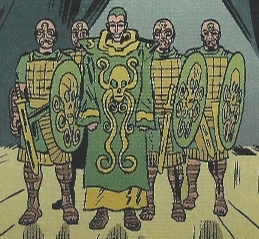 Geist ordered his loyal Hydra agents to connect him to one of the gods to maintain Geist's life. As a group of Avengers broke into the Cauldron base, Geist's zombies, Auferstehungs Corps, and other agents held them off until Geist could be spliced to the chest of the "Great God Hydra" (as Geist referred to him; we'll go with GGH). The Avengers attacked, but the revitalized Geist fought back against Rogers until the Great God Hydra (GGH) grabbed Rogers. 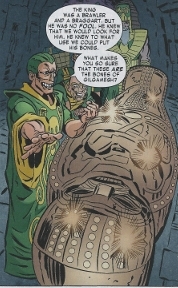 As the GGH struggled with speech and awareness (struggling repeatedly to speak the words "I am god"), Geist admitted that this first god was not perfect, as Rogers had forced his hand, but that the gods were designed to be vital beings, who would learn, grow, and adapt, as he guided and taught them while they evolved into true omnipotence. 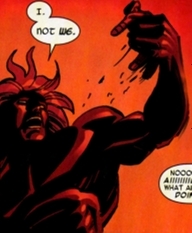 Geist urged the GGH to crush Rogers, but the GGH refused, noting "I am god...I am...I...not we" as he tore Geist from his chest. Claiming to see backward and forward into eternity, the GGH noted that only gods lived forever, not mortals. Dying, Geist told the GGH he had made him and could no longer live apart from him as he begged for mercy. The GGH granted him mercy and oneness with the universe, instantly crushing him to death in his hand. The GGH noted that Rogers was the champion of not just his country, but his species, his world, and ultimately many worlds. The GGH further noted that he saw constant conflict and weary roads laying before Rogers, and that death may never claim him to give him peace. He further detailed that though Hydra created him, men did not own gods. Refusing to spend the first hour of life his eternal wandering by attempting to destroy that which fate itself had fashioned, the GGH blessed Rogers and bade him farewell (calling him the "once and future Captain America), before vanishing (presumably to explore the universe) in a flash of light. The "Great God Hydra" appeared to be a good 50' tall, with vastly superhuman strength and durability, unspecified energy manipulation powers (enabling it to teleport/warp away from Earth). Presumably possessing some extended lifespan, if not full immortality, the GGH also claimed to be able to see forward and backward into eternity (and seemed to have at least some degree of precognition). Note: It's not clear to me what happened to the rest of the Great God Hydra's brethren. At least 3 others were seen in their immense stasis/development tubes, but only one was seen to awaken. Did they perish? fail to revive? were they destroyed in the explosion? or are they still in stasis somewhere, either in Hydra's or the Avengers' custody? In one last look at the final panel of his appearance, it seems he may have taken his brethren with him (or destroyed them as he departed?). Hydra's zombies seemed to be like classic zombies (reanimated corpses, often under someone's control), but were likely just partially resurrected using a fragment of the Lazarus formula, much like Trude Lohn was partially resurrected in Captain America: Hail Hydra#4. It is certainly possible they were obtained under other means. (Captain America: Hail Hydra#3) <A few years ago, circa Captain America I#170> - Zombies serving under Geist attacked Solomon's Grotto, one of the most sacred places in Wakanda, and a repository of vast and ancient secrets, including ancient codices said to contain the alchemical formulae for the Elixir of Life. (Captain America: Hail Hydra#3) - Black Panther (T'Challa), Captain America, and the Falcon (Sam Wilson) destroyed the zombies at Solomon's Grotto. From the chest of one of the creatures, T'Challa found bag's filled with some exotic compounds (including the neurotoxin tetrodotoxin (found is certain species of blowfish), as well as toxins found in the bufo marinus cane toad and the osteopilus dominicensis treefrog...a mixture also known as a coup poudre, what Haitian bokors used to create zombies), as well as a disk containing a hydra. Captain America recognized the involvement of Hydra and Geist. (Captain America: Hail Hydra#3) - Captain America traveled to Haiti to meet with Dr. Cyril Lewis, an ethnobotanist trained at the University of Pennsylvania, who was collating all information on coup poudre to create the perfect formula. They were attacked by a group of zombies as well as Erlking, who taunted Cap by accusations that his survival was related to the Lazarus formula, not the Super Soldier serum. Erlking snatched and nearly escaped with Dr. Lewis' notes, but the Falcon retrieved them. (Captain America: Hail Hydra#4 (fb) - BTS) - Strucker had Trude Lohn exhumed and partially resurrected, granting her decayed corpse her thoughts and memories, as well as the power of speech, but little else. Geist informed her of a plot to reanimate Arlington National Cemetery. (Captain America: Hail Hydra#4) - Strucker and Geist subsequently watched der Unsterblich easily overcome a group of Hydra's zombies. Cap took out the Hydra agents at the Yummy Yum-Yum Cookie Company, where he encountered the partially resurrected Trude Lohn, who delivered her message. She then begged Cap to put her out of her misery, and he complied. (Captain America: Hail Hydra#5) - Rogers led Black Widow (Natasha Romanoff), Cage, Captain America (Barnes), Hawkeye (Clint Barton), Thor, and War Machine assaulted the base beneath the Statue of Liberty, which proved to be Geist's base, "The Cauldron." 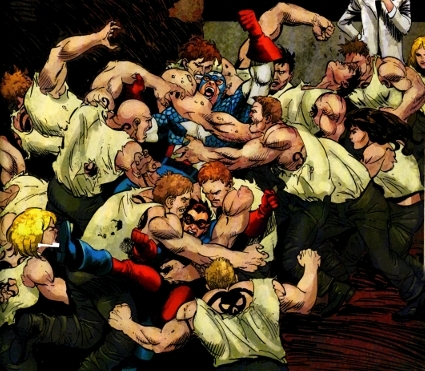 Erlking sent a group of zombies to battle the heroes and tried to convince Cap to join them, not realizing this Cap wasn't Rogers, and Barnes punched him out, while the other Avengers routed their other attackers. Nonetheless, the delay enabled the "Great God Hydra" to revive, which Geist spliced to its chest.